TENERIFE, Spain (AP) — Here we are on the eve of the FIBA Women’s Basketball World Cup getting started and I’m so excited to wear the USA jersey again. It’s been a fun few weeks since the WNBA season ended training with USA Basketball and my coach Dawn Staley. I’m glad I can be along on this journey with her. It’s definitely been a great experience for me to be part of this World Cup team right now with so many great players like Diana Taurasi, Sue Bird and Tina Charles. To be surrounded by so many future Hall of Famers is a good thing. I’m just trying to be a sponge and soak it all in. It was so awesome when my teammates and coach surprised me in New York after practice one day telling me that I won the WNBA Rookie of the Year award. I definitely wish I could have celebrated with my Las Vegas family, but my USA teammates made it special for me. Being Rookie of the Year wasn’t a goal of mine coming into the season, I just wanted to be a great teammate and take it all in. Winning the award was definitely something special though and having coach Staley tell me made it even cooler. She was such a big part of my transition to the pros. I haven’t really had a chance to let this whole year sink in yet, but I’m sure when the time comes I’ll be able to sit back and take it all in. The other cool thing about training camp was that I got a chance to reunite with some of my South Carolina teammates. Having Tiffany Mitchell and Allisha Gray in camp was awesome, not to mention Tyasha Harris. Getting a chance for us to play at home in South Carolina one more time was really, really special. Then it was off to Connecticut, Washington and France to play some exhibition games and they got me so hyped for this tournament. You’ll see me out there wearing No. 9 now. That’s so huge because that was Lisa Leslie’s number and she was definitely a role model of mine growing up. I didn’t get a chance to see her play in person, but I won the inaugural Lisa Leslie Award last year in college. I will wear No. 9 with pride for my country and because I know someone great like her wore the number before is something I appreciate. One of the really cool things about this trip is that I get to spend time with my mom. You all know how important family is to me and to have her in Spain at the worlds is really special. She gets to enjoy this journey with me. Dad will be coming to China when I play there this winter. For now it’s time to get ready for our first game against Senegal on Saturday. This isn’t my first time in Tenerife having won the Under-19 championship here in 2013. That team was fun with Kelsey Plum, Breanna Stewart and Morgan Tuck all on it. Plum was my roommate for that trip and well we didn’t ever speak, but now we’re best buds playing together in Las Vegas and here. Hopefully this one too will end with a gold medal. 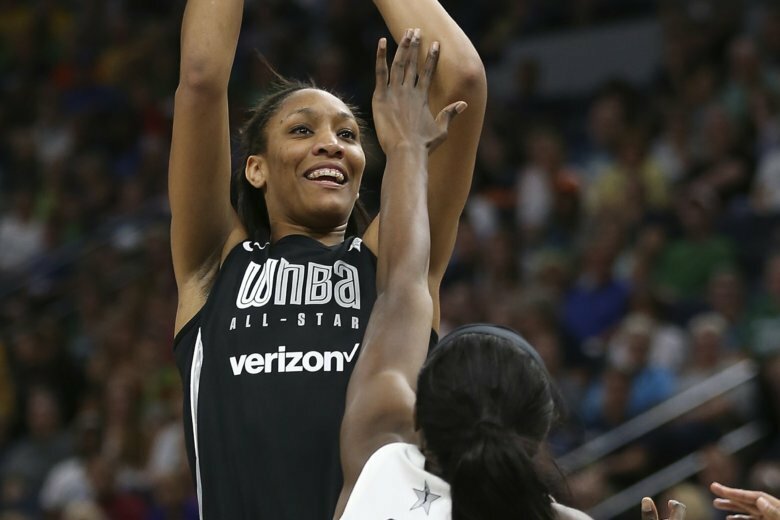 Las Vegas Aces star A’ja Wilson is checking in periodically from the FIBA Women’s Basketball World Cup. It’s been a busy few weeks with USA training camp, winning Rookie of the Year and finally making the team.